Happy Monday everyone. I'm already having withdrawals from this weekend as I'm so sad it had to end. I spent it in Burlington, Vermont with my cousins, and had the best time. Saturday morning we explored the Burlington farmers market, had a nice lunch downtown, then the afternoon and evening were spent countryside at my cousins home hanging with the family. There was a lot of game playing, indulging in comfort food, and story sharing over many glasses of wine. I decided to wear my Rails plaid shirt on Saturday, and it ended up being the perfect choice for the days activities. There is nothing that screams fall more than a plaid shirt, and when it comes to the perfect plaid, I believe Rails does it best. Not only do I love their designs, but they are so soft, I could sleep in them. I finished my look with my red flats, and was very comfortable walking around in them all day. Although a pair of flat boots or UGGs would have worked great too (yes, I still love wearing my UGGs when I'm countryside)! In case you missed it, I've teamed up with some awesome bloggers for a $500 Nordstrom or cash giveaway, you can enter here. Thank you for reading. I wish everyone a fun and productive week! Your oversized plaid shirt is gorgeous and I love those flats as I have told you before. Enjoy this week gorgeous Rachel! So pretty in plaid! Loving the lace ups too. 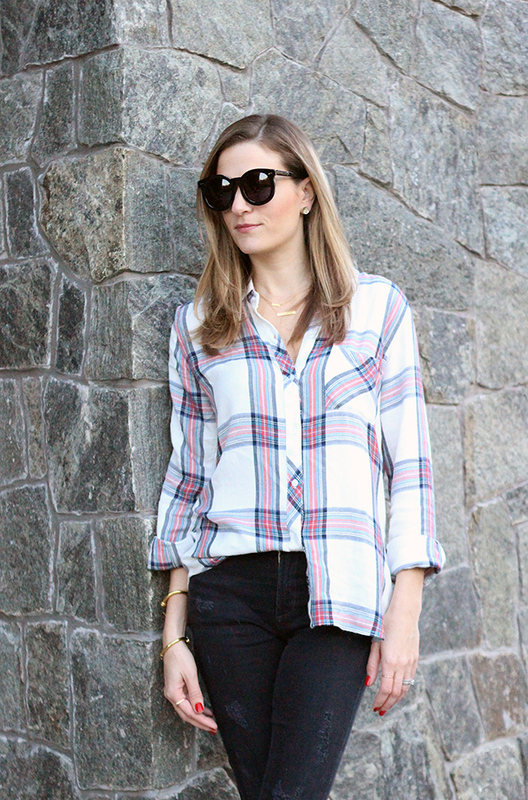 This plaid top is super chic, love it! Great look - love those flats!! Love your plaid shirt and I love it styled with the red lace up flats. You look great! That plaid shirt is perfection--I feel like I'm always on the hunt for the perfect one. I just got those lace-up flats from TopShop, so thanks for the inspiration for another cute look for them--love them with the laid-back plaid! I love that plaid shirt!! It is so cute!! Those shoes go perfectly with that outfit!! You look gorgeous!! SO cute! Loving the plaid and the pop of red in the shoes is so perfect! Love this plaid top! 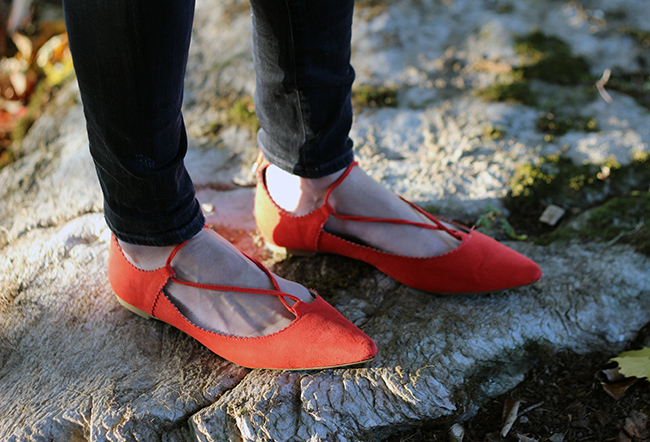 I'm obsessed with your red lace up flats too...gorgeous pop of color. Hope you have a wonderful rest of the week. your flats are so cute! great fall look! You look fabulous!! Love your shirt!! cute outfit dear, the plaid looks nice on you! I love those flats! They go perfectly with the plaid top! I hadn't heard of Rails yet, they sound great! Love the top. I love soft, yummy tops. Rachael you look wonderful in this relaxed yet chic look. Those flats are so adorable. Another perfect way to wear those gorgeous red shoes. Thanks for linking up again! I love those flats! They go so well with your skinnies! I've been looking everywhere for a plaid button down! My hunt continues so I can look as cute as you! Perfect plaid look! Love your flats too! gorgeous outfit! loving the plaid<3 stay in touch! I never can have too much plaid! I love it! And it's so pretty paired with the red lace ups. Vermont is on my list of places to visit one day! Love Burlington so much! I would always go there on the weekends while I was studying at Middlebury College. Love the outfit - you can never go wrong with plaid in fall!